Would you be interested to invest in a villa in private estate on the French Riviera? 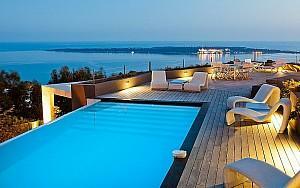 You should then discover the exquisite collection of high end villas on the French Riviera offered by PALM REAL ESTATE. If you want to stroll in style on one of the most popular avenues, party like a rock star, try your luck at the casino, enjoy a rich and diverse night life, the world-famous spots on the French Riviera are waiting for you. For those who are looking into investment opportunities, a high end villa on the French Riviera could also be a top alternative asset to own. Do you see yourself living in a quiet area, where class meets comfort and tradition meets modernity? Then, you need to see our selection of luxury properties in private estate on the French Riviera to discover your future home in the south of France. Houses in gated estates located in La Roquette sur Siagne, Grasse, or Super Cannes, could be a great choice for those who love to dwell in top quality, stylish residences in the south of France. Superb villas in private estate in Cannes with a view over the hills, luxurious family houses situated at the heart of a gated domain, secured and offering top quality finishes, very quiet villas in private estate in Grasse of recent construction with superb views of the hills and a beautiful glimpse of the sea, are only some of the opportunities that you should consider before making your choice. PALM REAL ESTATE’s team of consultants is ready to offer you professional assistance regarding the house that best fits your needs and your budget. Don’t hesitate to call us if we have caught your interest with our wonderful selection of luxury properties in private estate on the French Riviera. Professionalism and quality are our watchwords.